You are here: Coaching Leaders > Blog: Emotional Intelligence, Appreciative Inquiry, Leadership > Goal setting > Do You Have The Wrong Kind Of Motivation? There are two kinds of motivation, ‘Towards’ (something you want) and ‘Away-From’ (something you don’t want). Both have their uses, but, as Harry Hill would say, which is better for helping you to achieve your goals? Anger, irritation, fear, or frustration with your current situation can be a great motivator to get you going, providing an initial kick in the pants to motivate you to get out of your current situation. But, as Dr Peter Fuda points out in his ‘burning platform’ video, it’s not sufficient motivation for sustainable change. For that, you need an element of ‘towards’ motivation as well – a vision of where you want to get to. If it’s strong enough, this could be sufficient on its own to motivate you to take action, even if your current situation is OK. Most people, though, are going to need both. Let’s have a detailed look at how the two kinds of motivation work. Imagine if you will that you suddenly realise that down by your feet is something really disgusting. You can smell it now too, and it’s really ripe! You have to get away from this thing – so which way are you going to jump? The answer is – it doesn’t matter. Any direction will do, as long as you get away from this horrible thing. ‘Away’ is not a direction! So that’s the first thing about ‘away-from’ motivation. It’s undirected. If you do have a goal, but your ‘away-from’ motivation is stronger than your ‘towards’, it may be taking you further away from where you want to end up. Now, once you get far enough away from the stinky object, and assuming you’re not downwind of it, you can’t smell it any more. So what’s happened to your motivation to move? It’s gone. If ‘away-from’ motivation is all you have, it runs out once you get far enough away from the thing you want to get away from. An exclusively ‘away-from’ motivated person will stay where they are until the next thing that they dislike comes along and makes them want to move again. This is why people whose motivation to lose weight comes from not liking what they see in the mirror always say they can’t lose that last half-stone (or couple of kilos). As they approach their target weight, what they see in the mirror doesn’t look so bad, and their motivation runs out before they reach their target. So the second thing to know about ‘away-from’ motivation is that it’s inconsistent. It won’t get you all the way to your goal. Finally, the worst thing about ‘away-from’ motivation is that it’s stressful. I have had clients who were outwardly very successful, but because all of their drive came from ‘away-from’ motivation, they were constantly stressed – whether their main motivation was fear of not living up to someone’s expectations, or anxiety about failure, or resentment of their competitors. If your only motivation is ‘away-from’, then to keep yourself motivated you have to keep thinking about unpleasant stuff. It’s no way to live. Let’s contrast this with ‘towards’ motivation – where you know where you’re aiming at, and you really want to get there. If you get knocked off course (as inevitably will happen sometimes), you just correct your course so you’re pointing at the goal again, and keep going. 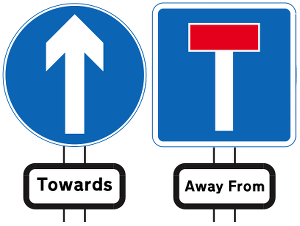 So ‘towards’ motivation is directional. As you get closer to my goal, your motivation if anything gets stronger. You’re almost there! It’s nearly within your grasp! Are you going to stop now? Of course not! So ‘towards’ motivation is consistent. Finally, it’s not stressful. Even if your current surroundings are unpleasant, your underlying mood is still positive, because you’re focused on your inspiring vision. Your motivation to make it happen will get you through any challenges or obstacles that you encounter. Is there any place, then, for ‘away-from’ motivation in successful goal achievement? Yes. As we said above, some ‘away-from’ can be useful to get you started, especially if you don’t yet have a fully realised and compelling vision of where you want to get to. Additionally, a little bit of ‘away-from’ can be useful for quality control. As you progress towards your goal, it’s worth doing the occasional ‘minesweep’ to look for any potential obstacles or problems, and eliminate or route round them before they happen. Overall, though, to get sustained progress and actually achieve your goal you would want your motivation ratio to be at least 70/30 ‘towards’ to ‘away-from’. This should make sure you actually keep going until you get there, and don’t stress yourself out along the way. 1. As you think about what you want to get away from, imagine moving it away from you until it’s small and distant. Usually this will reduce unpleasant feelings. 2. Think about what you want instead of what you want to get away from. Get very clear about what this will look like, sound like, and feel like. Adjust your image until you are strongly motivated to get there. Usually imagining a big, bright, 3d picture of it will give you the strongest motivation, especially if you add sound as well. Alternatively, if this works better for you, write a one-page description of where you want to get to. Revise your description as much as you need to make it really compelling. 3. Check the proportions of your motivation again. If the ‘away-from’ component is still over 30%, imagine that you’ve taken some action already and got some way towards your goal. What does the away-from component feel like now? 4. If imagining what you want doesn’t come easily to you, think about your values – what’s important to you. This should help you to get clearer about what you want. Questions? Doubts? Results? Comment below and let your fellow readers know how you got on with this article! I think this is a great reworking of the basic advice I hear in women’s magazines about orienting your goals mostly around “towards” or “pull” motivation. And I agree we shouldn’t run around being stressed and scared all of the time to get things done. However I also have found there are people-myself included-who work best with more like a 60/40 away/towards motivation because their ability to FANTASIZE or to act “as if” the goal has already been achieved is just too good or two strong. Usually these people have an easy time constructing fantasies and are very plan/future oriented with poor memories and are able to brush off defeat easily. They forget the away from motivation too quickly so the next time, say, the project deadline is looming they spend their time fantasizing about knocking the presentation out of the park, winning their boss’s favor, etc. and the memory of the last horrid encounter with said boss because of shoddy last-minute work has fallen by the wayside. For these people I think an away motivation can be important and what’s MOST important is really chronicling or taking to heart the details of those “stinky” moments–the mad boss, the fear of losing a job, the discomfort from wearing tight jeans all night–and trying to freshen them up as commitment to a goal wanes. Thanks Lee – I’m always open to ideas about what works in goal-setting and recognise that different things are going to work for different people. Is that 60/40 away/towards stressful to work with though? A good and simple summary however there is much deeper stuff connected to towards/away from motivation. It is necessary to get into it’s destructive roots and the clash in beliefs and values within that leads to the anxiety and the desire to retreat rather than move towards a goal. Unless these things are dealt with and understood then the empowerment even if on a conscious level there is understanding will be limited! Are you talking about unresolved internal conflicts Jeremy? I have written about these and their effect on leadership here.